Today is the Tour Of College Park Fun Run sponsored by Fleet Feet and Harmoni Market. It's a small 5K run/walk through College Park starting at 7:00. Harmoni Market will be presenting a $21,000 check to the Mayor for the Burhnham Institute. Yea for a good cause! I am delighted to tell you about some of our local artists, Rose & Jo Designs. Rose & Jo are actually two people, Kimmy Jo and Jessie Rose, of Lee Middle School right here in College Park. 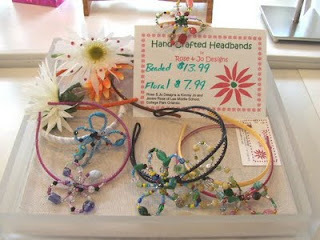 "We devote about 35 minutes to create each headband using high quality and vintage beads. No two are alike! You can carefully position the flexible petals however you desire. All our pieces are double wired for strength & durability. Each piece is a little story of love and life. We hope you choose to make it part of yours!" We proudly off them at the store for ONLY $13.99! Stop in and try on a little happy! Check it out! 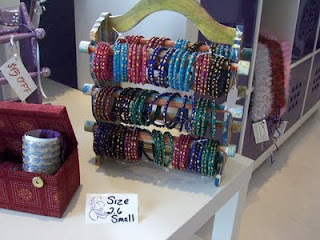 New fancy bangles to mix with your glass bangles! 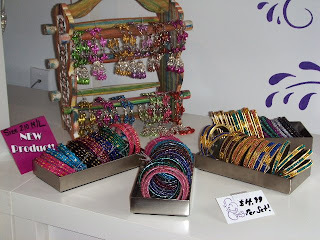 These bangles are exclusively available at our store. I have acrylic bangles with dabka decoration and also wired glass bangles with floral motifs in a great range of colors. 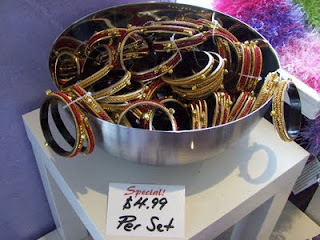 There is even a selection of basic jhumka bangles. The best part? You don't even have to buy a full set! They are available in small half size sets for only $4.99! Mix and match as you will! This is turning into quite a monthly event! 2nd Saturdays On the Drive is a local College Park movement to get some fun and action happening along Edgewater Dr, once a month! 2nd Saturdays On the Drive is a free event held on the second Saturday of each month from 5:00 - 9:00 PM celebrating community, art, culture, music, shopping, and dining in College Park, just minutes outside downtown Orlando. College Park comes alive with local artists, vendors and entertainers along the Edgewater Drive Business District. Businesses open their doors to patrons for food, fun, and shopping! Come hang with us THIS Saturday! Henna guild members, Florida Tribal Dancers, Eyegasms, and vendors!